Welcome to the World, Ethan Thomas Schultz! Jay and I had been out in the city all afternoon on Monday October 15. We had to go to do some shopping and had a lunch date at Olive Garden. As we were devouring the deliciousness that is Olive Garden salad and breadsticks, I turned on one of my pregnancy apps and started, for the first time ever in this pregnancy, timing contractions. Hmmm…. I thought to myself…. this is weird and interesting! You see, with Braden…I never had “false labor” of any kind. Once my contractions started, though irregular, they gradually built up into the real deal. Jay could see the look on my face and asked me what was going on. I told him I wasn’t sure if they meant anything, but they definitely were “there” and they definitely were not Braxton-Hicks contractions, which I’ve been getting since 17 weeks. As we left lunch, Jay asked if I was sure we should be going shopping. YES! I said…I had to get things done! Funny enough, as we were walking through the mall, the contractions stopped. Usually if its the real deal, they pick up with walking…so I thought I was in the clear. Mind you, I texted Laura and told her that if I wanted to have a baby right now, I’m pretty sure I could get labor going with some vigorous walking – ha! On the 1 hour drive home, the contractions picked up again and I started timing again. Anywhere from 2-12 minutes apart lasting 30-60 seconds. Nothing I couldn’t cope with. By the time we got home and unloaded the things we bought shopping, nothing was happening. We had supper, I watched Dancing With The Stars with my mom, who was here as back-up babysitter for Braden, should anything happen as my in-laws were out of province, and went to bed. False labor, round 1….or so I thought! At 12:30 AM I was woken from a dead sleep and thought I had reached an all time pregnancy low. I woke up because my underwear was soaked. Great! I thought. I couldn’t even make it to the toilet – I’ve peed myself. So what do I do? I text my SIL Laura. I sat on the pot for 10 minutes in a sleepy haze trying to figure out if my water really had broke. That MUST be the cause for all the wetness…I seriously did NOT pee myself…did I? I went quietly through our bedroom, so as to not wake Jay to get new undies. I sat back on the pot and more liquid was there…Yup. Water…consider it broked! I put a big mama pad on (ladies, you know what I’m talking about)…and I went into the kitchen and called the hospital. I wasn’t having any contractions or anything, and part of me really just wanted to go back to bed and try to rest! BUT the other part of me knew that last time my water was broken for me…I had Braden 2 hours later. The nurse told me to come right away…so I woke Jay up, told him my water broke, and he shot up from a dead sleep like a canon! I went downstairs to wake up my mom and she couldn’t believe it either! We had our bags packed…but we were still scrambling around to make sure we had everything. I’m a VERY Type A/organized person…and I had SO much on my to do list in my 37th week, I thought I’d be laughing….yeah, notsomuch! So I went into my big boy’s room, kissed his sweet cheek one last time as my only child, felt my eyes tear up…and we headed to the 45 minute drive to the hospital. We arrived at the hospital at 2:00, I give my pee sample and my story thus far to the nurses and I’m hooked up to the fetal monitor for 1/2 hour or so. The monitor is showing exactly what I’m feeling. Contractions, about 3 minutes apart and lasting about 30 seconds. Sounds scary, right? Well…they weren’t “the” contractions…if you’ve been in labor before, you know what I mean…but I was hopeful that things would pick up and that this baby would be born in no time! I had texted my friend Sam, our photographer, once I knew it was the real deal…that she could come any time! The nurses checked me and said I was a 4-5 cm! I was thrilled! Sam arrived around 3:30 and it was so lovely to have her there. It gave me a huge distraction and allowed Jay to have a bit of sleep, since I knew I wouldn’t be able to. With Braden’s labor I was in bed, on my back the whole time and I did NOT want to do that again. I was up, walking around and things felt great. Sam actually had her pedometer app on and we walked almost 3 km! I had lost my mucous plug and had my bloody show around 4:30, which were good signs that things were going to get going. Contractions were starting to pick up around 5:30 AM. I knew the nurses were going to check me at 6:00 and I was so anxious to see the progress I was making. Contractions were about 2.5 minutes apart and getting stronger…I was at the point where I couldn’t talk through them, I had to focus and breathe through them. 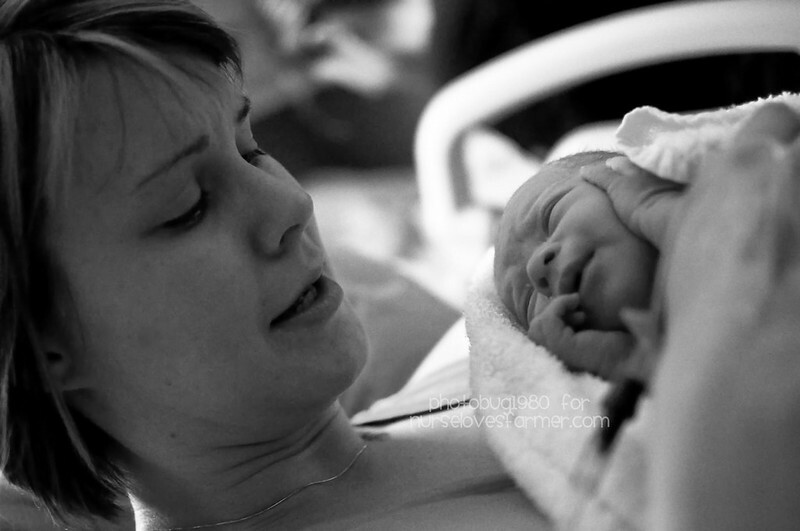 I pictured Braden sleeping peacefully – the last image I would see of him as my only child – and it really helped me relax and get through those contractions. The nurses came shortly after 6:00 and said Dr. Maseka would be in soon and he would check me. He came around 6:30, checked me…and told me I was 4 cm. WHAT?! SERIOUSLY? I thought I was 4-5 when I got there! 4.5 hours later and NO progress? I was so frustrated and defeated. I felt like all my walking, relaxing, breathing, contracting…was all for nothing. You see, with Braden…I was on about the same timeline. Got to the hospital at 2:00 AM, Dr. checked me at 6:00 and I was 6 cm, broke my water, and I had him just before 8:00. I was expecting that this would go faster and felt so deflated that I definitely was NOT having this baby before 8:00 AM. But, with Braden…the contractions were strong and uncomfortable from about 4:00 AM until he was born at 8:00 AM. My contractions weren’t that uncomfortable yet. I got pissed off, rolled over in bed and even fell asleep briefly. My contractions slowed down to about 5 minutes apart and I could almost sleep through them…but then one woke me up. At 8:30 I was texting my mom and nothing was happening. I decided to go for another walk with Jay and Sam and had 3 pretty big contractions that stopped me in my tracks, so I decided it was time to go back and stay in my room. At about 9:00 I sent Sam out as I was starting to get really cranky. NOT at her, she was a saint…but I could just feel myself getting really ticked off that I didn’t have this baby yet and contractions were starting to really pick up in intensity and frequency…and I didn’t want my friend to see me in such a state! At 9:15 I was starting to lose control of myself. I started to get really anxious and even feel panicked. Why didn’t I have this baby yet?! I had Braden by now! What’s wrong with me? WHY!? I asked the nurse to check me because I REALLY needed to see where I was and if I was making progress. I seriously wanted to throw in the towel. I want to be in my cozy bed. I want to have this baby in 17 more days like I was supposed to. It was just me and Jay and the contractions were really picking up. Stronger by the second and no position I was in was working for relief. I confided in my husband, my best friend – I don’t think I can do this naturally this time! I know I’ll regret it if I don’t but this is SO different I don’t think I can take it anymore!! Jay was wonderful. He told me he knew I didn’t want to use drugs again. He thought I might regret it if I did, BUT, that I needed to do what I had to do, and there was no shame in that. At 9:30 my beautiful, sweet nurse Amanda came in and I talked to her. She was a student when I worked there 3 years ago and I couldn’t believe what an outstanding labor & delivery nurse she had become. (I’m tearing up just thinking about her right now…) I told her to give it to me straight – was fentanyl REALLY worth trying? It’s a narcotic, I was in the right time in my labor to have it…but I still didn’t think I wanted it. She told me it would take the edge off. As a nurse, I know fentanyl is very short acting and I decided not to have any as I didn’t think it would work at all, especially with how these contractions were feeling. I then said the “e” word that was not supposed to be in my L&D vocabulary. Teach me about it, Amanda…give it to me straight. Will this halt my labor? Will it really work? HELP!She said at this point in my labor, no – it would not slow it down. It would help me to relax, take away the pain, and let the contractions do their job – to dilate my cervix and move this baby down for birth. She left the room and told me to let her know what my decision was. I looked at the clock and thought I would give it until 10:00 and then opt for the epidural if nothing was happening. At 9:40 I had another heart-to-heart with Jay about how confused I was. I think in this time frame I also tried to call my mom, but was rendered helpless as I could not speak through my contractions. I was frustrated and I felt like a failure. I was disappointed in myself that this baby might not be born naturally and drug-free like it’s big brother was and that I was depriving myself of that feeling of accomplishment I had when I delivered Braden drug-free and naturally. So Jay went to get Amanda and tell her I needed the epidural. It just so happened Dr. Maseka was in the hospital as he wanted to check me before 10:00. I could tell what my doctor was thinking, but Prase Him that he didn’t say anything. My sweet, wonderful doctor was likely thinking – you’re so close! There’s no time for an epidural, it’s almost time to push! But all I could think was to compare to what I knew – when I was an 8 cm with Braden it took me two hours to get to 10 cm and push & deliver. I.could.NOT wait another 2 hours. I just knew what I was capable of and two hours of intense contractions, way stronger than I remember with Braden, was not something I felt capable of. 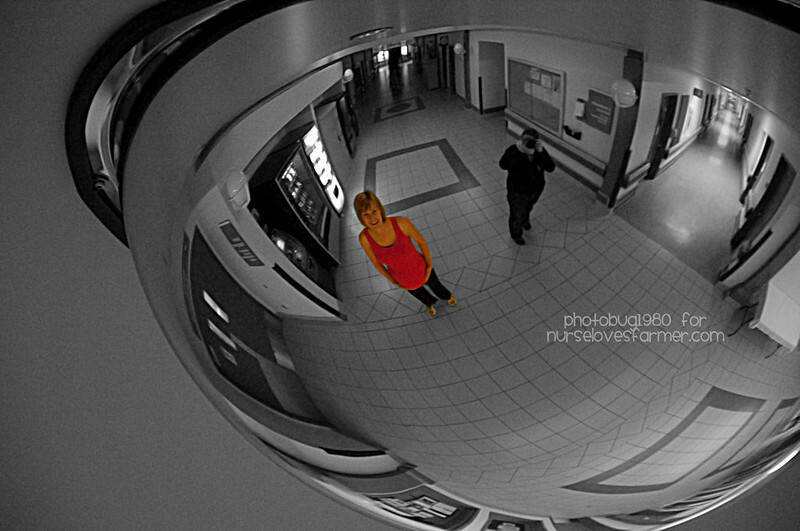 It just so happened the anesthetist was in the building (small town hospital – a rare occurrence!) so Dr. Maseka went to grab him. My IV was started and Dr. Maseka said the anesthetist was going to just do a spinal shot vs an epidural because it was “going to happen fast”. She looked at Dr. Maseka, who quickly glanced below, and Amanda gave me the thumbs up to start pushing. Two more nurses came in the room, there was lots of scrambling – though they had been set up ever since I was admitted as they thought I might go fast – and they quickly transformed my bed for delivery. Between contractions I somehow got my legs in the stirrups and my bum as low as I could. Last time I was told NOT to push. This time I had no coaching and just started. I pushed with my contractions…I think it was about 5 pushes…they told me to slow down…stop….just push a little. Less than 5 minutes of pushing…and – IT’S A BOY!!! 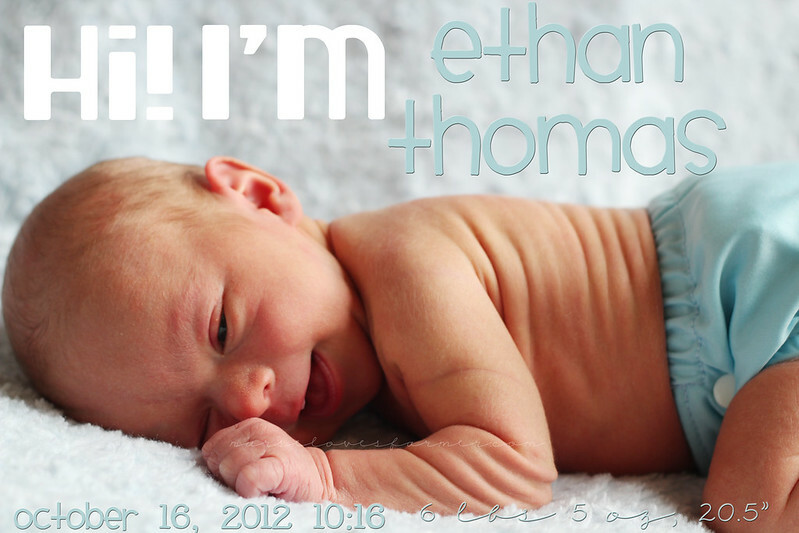 – Ethan Thomas Schultz was born at 10:16 AM. I guess with Braden it was a gradual, but still fast, labor…with Ethan it was quite slow at the beginning and an absolute sprint to the finish. When I analyze (because that’s what I do!) the two labors, Braden’s was about 6 hours of active labor with 4 of painful contractions gradually increasing in intensity. 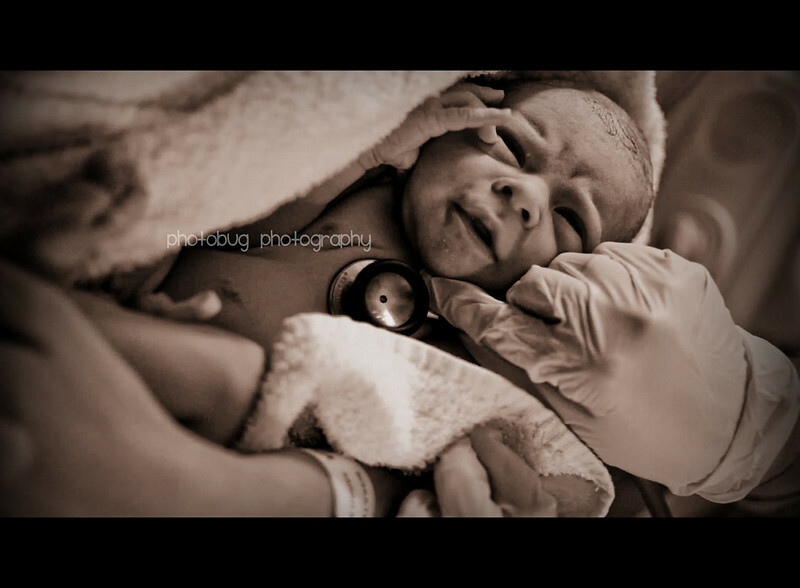 Ethan’s was also about 6 hours of active labor but with “only” 1.5 hours of very intense, painful contractions. The transition stage happened gradually with Braden but was a total sprint with Ethan. What a difference! 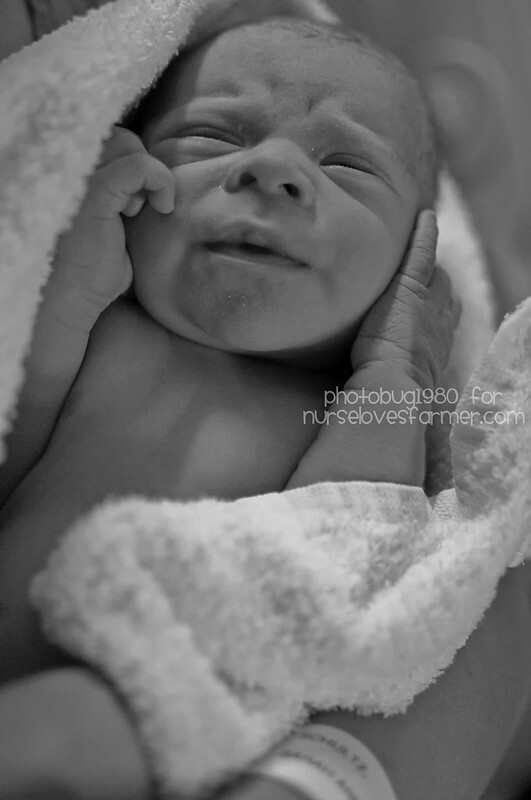 By the grace of God (more on this later), our 2nd baby boy was also born naturally and med-free. I did not tear, had a normal amount of blood loss, and our boy was perfect and healthy with APGARS of 9 and 9. And with Jay declining for the 2nd time…mama cut the umbilical cord again! I guess technically I did have drugs during labor. The third stage of labor is the delivery of the placenta. Last time it just slid right out. This time…not so much. With the story of one of my best friends having to be sedated to manually have her placenta removed, I wondered what was wrong with me and hoping I wouldn’t have to have the same happen. Why wasn’t it just coming out? The sensation of the cord on my lady parts was absolutely spine tinglingly painful. Seriously – it was SO sensitive down there I could not stop my legs from shaking and he was pushing down on my uterus to help contract. He told the nurse to give me some fentanyl because the sensation (not the pain – but the sensation) was just unbelievable! I didn’t object because I was elated with adrenaline from just giving birth and marveling at our new baby boy lying calmly on my stomach. Honestly though, I couldn’t feel the fentanyl and believe it didn’t work anyway. Luckily after a few minutes my placenta was safely delivered and I could get my legs out of the darn stirrups and have a bit of my dignity back! I LOVE this picture of Ethan. 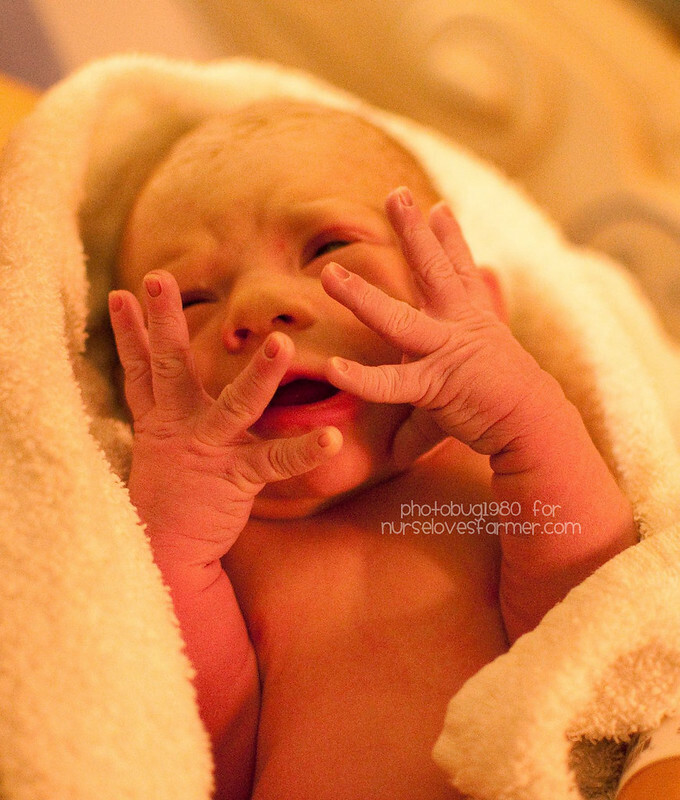 He’s had his hands up in his face since the moment he was born – literally! THAT. That makes it worth it. Oh it was so worth it. However, I did also say, shortly after he was born: “Jay, we’re NOT having 3 kids!” Of course one never knows, but that’s how I felt after I just delivered Braden too!I also said “Laura is going to be SO happy!” because although she thought it was a girl…she was also not-so-secretly rooting for me to have a boy so that ALL our boys could grow up together. What a special, special thing! Blake and Ethan are only 10 weeks apart – to the day! I know this was long. But I wanted to remember every single detail that I could so I can look back on this wonderful birth story and relive it many, many times! Thank you, thank you, THANK you, Samantha for being part of Ethan’s birthday and capturing these precious memories on camera for us to cherish for years! I love all the details and the photos. Oh my gosh, in the last photo, those rolls!! !